(AFP) Senate Republican leaders forced a vote Tuesday on a climate change measure they ridicule, seeking to corner Democratic presidential hopefuls over an expensive, economy-upending plan proposed by the party’s left wing. 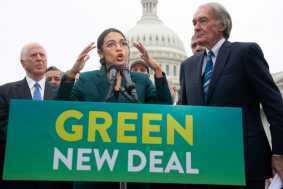 The chamber easily rejected the Green New Deal, a proposal offered by progressive Democrats that would dramatically shift the United States away from fossil fuels toward renewable energy in an unrealistic effort to zero out greenhouse gas emissions within a decade. Several Democrats running to challenge President Donald Trump next year have signed on to the plan. Six Senate Democrats are 2020 White House candidates, and the chamber’s Republican Majority Leader Mitch McConnell sought to get them on record supporting what would be a multi-trillion-dollar boondoggle. “I could not be more glad that the American people will have the opportunity to learn precisely where each one of their senators stand on the ‘Green New Deal’: a radical, top-down, socialist makeover of the entire US economy,” McConnell said. “Some Democrats are trying to run away from something they previously embraced,” said Republican Sen. John Barrasso of Wyoming, Chairman of the Environment and Public Works Committee. “If so many Democrat Party leaders support the Green New Deal, why aren’t they willing to vote for it and stand up behind it today? Democrats accused the Senate’s Republican leadership of quashing debate and blocking any public hearings on climate change. “We need real action on climate change — not this kind of sham vote,” said 2020 contender Senator Kirsten Gillibrand, who has wholeheartedly embraced the Green New Deal. “Climate change is a global crisis, not a political game,” added Senator Elizabeth Warren, a liberal presidential candidate who also supports the Green New Deal. The plan does not detail how America will wean itself off of fossil fuels, or how much the ambitious transformation will cost. Republicans are seeking to make climate change a wedge issue in the election. Trump himself mocked Democrats over the plan. “No planes. No energy. When the wind stops blowing that’s the end of your electric,” he told a laughing crowd at the Conservative Political Action Conference this month. The plan’s champion is Democrat socialist first-term congresswoman Alexandria Ocasio-Cortez.